Cubicle facilities can be expensive to furnish. While it may be tempting to look for the cheapest option available to you, do be sure that the product you are buying is of a good quality and suited to your requirements to ensure that it will stand the test of time. Smooth surfaces are much easier to clean than uneven or shaped surfaces, as dirt can become trapped within the crevices. 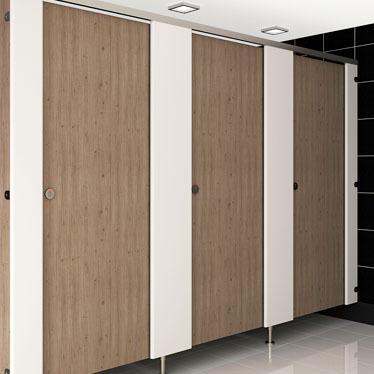 Where possible, consider installing streamline partitions, cubicle doors and drawers and cover any exposed pipework to avoid it collecting dust and dirt that may be awkward to keep clean. Cubicle legs help to ensure that no dirt becomes stuck on the underside or lower half of your cubicle partition, they also make it easy to clean the entire floor. For those who are wanting to optimise on privacy and cleanliness of facilities, there are even short legs available which can offer just 20mm clearance from the floor. For more guidance on how to best set up your facilities, check out our previous blogs on Maintaining High Levels of Hygiene and Selecting Cubicle Hardware?